LD "Blue Suit" "Fox" "Sleepy Fox" "Rainshifter"
LD, also known as Fox, Blue Suit and Sleepy Fox depending on the circumstances (previously Rainshifter), is a top level Smash 64 solo Fox main and a member of TR3G. 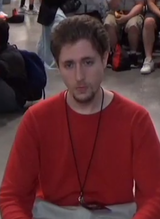 He notably plays using a Xbox 360 controller, but has been seen using a Hori at Super Smash Con 2015, and has also recently entered Smash @ Xanadu weeklies playing with the regular Nintendo 64 controller, where he often takes first place over many Baltimore regulars such as Nintendude, Shears and Bark Sanchez. He is known for his intelligent and unique playstyle involving patience, use of Fox's Laser, as well as an unforgiving punish game and edge game, and has become notorious for being one of the best Fox players while not being particularly technical. He is very comparatively hard to edgeguard compared to most Foxes, due to his mixups with aerials and various Up B angles. While he is strong at most matchups, his mastery of the Pikachu matchup is most well known of; he has taken sets off some of the best Pikachu players in the world such as Dext3r from Mexico and Banze from Brazil and most notably Alvin from Peru at Super Smash Con 2017. Following his top 8 finish at Apex 2015 and Super Smash Con 2015, LD is considered to be one of the best Fox players in North America along with The Z. He is also known for arguing against console use, speaking in favor of using emulators in tournaments instead. This page was last edited on April 16, 2019, at 18:10.